I was more than happy to find this ornament for my Great Grandson!! Its so rare to find "Great" Grandma products so this was a gem. Besides being adorable I was also able to personalize it!!! My Granddaughter and her husband loved it for my Great Grandson!! I'm so happy he will be able to put it on the tree for years to come from his Gam Gam as they call me. I absolutely loved both the Great Granddaughter and Great Grandson since I have one of each. So of course I bought them both. I was so excited and happy. Thank you Miles Kimble!!! 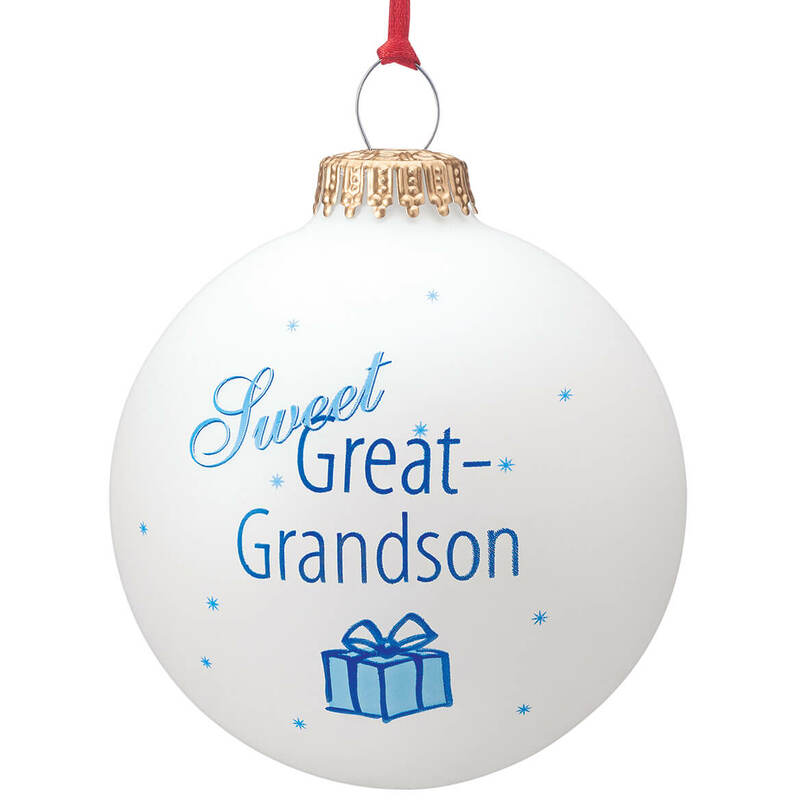 I love this Great Grandson Christmas Ornament! He is just a little guy, but we love him with all our heart. I bought this for my 89Yr old Mom to give to her Great-Grandson for Christmas. I was not sure if i would have it by then because i got it personalized and you were very busy and they told me they i might not get it before Christmas. I did received it Christmas Eve and made my Mom very happy. Thank you so much!!!! This item will be given to my Great-Grandson as a Christmas gift. For my first great grandson - very appropriate. I GOT THIS FOR OUR FIRST GREAT-GRANDCHILD TO HAVE ON HIS TREE. IT IS VERY PRETTY AND THE SCRIPT OF THE NAME IS QUITE ATTRACTIVE. A very nice addition to my granddaughter's Christmas Tree. it is a keepsake that my great grandson will always have which shows that he is very special. I have bought one of these for all 6 of my grandchildren and now one for my great grandson. I am very pleased with theses ornaments. I haven't used the product since it didn't come until after Christmas but will use it next year. I would like brighter colors for Christmas like a darker blue. Just a suggestion. packed that there were two lengths of brown paper to protect 18 ornaments and 2 NFL mugs. The Sweet Great Grandson Ball ornament was totally destroyed and there was glass throughout the box. I know that this is a beautiful ornament because I ordered the same one for my great granddaughter 4 years ago. 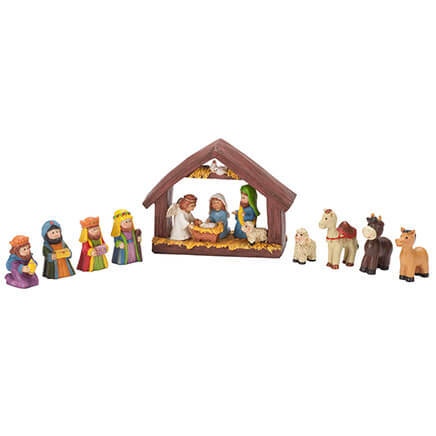 I have ordered ornaments for several years from Miles Kimball and this was the most disappointing as ornaments were (sold out) and I did not find that out until I called asking when my order was going to be arriving. I placed my order on 11-28-16 and received it on 12-21-16 after making calls and having to substitute ornaments for the ones I had originally ordered I am still waiting for one that was not in the order. My 1st great-grandson was born 5 weeks ago. I always start my grands with ornament for Christmas. For Grandson Carson's second Christmas. 1st Great Grandchild, he might keep it until his children are delivered, and it might become a tradition. Because I have a great-grandson! All the great grand children have one of these. A tradition. I like this style ornament. Perfect for my great grandson. I have 2 Great Grandsons and I wanted something for them to remember me by. I wanted to give my Grandparents something special this Christmas in celebration of the birth of my son. Christmas gifts for two great grandsons. Could have their names put on them. A very cute personalized ornament. I am always satisfied with their products. Still an infant. Great-grandchildren overwhelmed with gifts from parents & grandparents. This is a memorial memento from Great Grandma. It's the first time I've seen anything for great grandson. I've been buying this ornament to place on my tree for every great grandchild as they have appeared on the scene! They love to find their name on G'ms'a tree. You are the only one who has both G'son and G'dtr available. Don't stop!!! I did not order this...unless last year. ? My third great grandson was born in July. Want him to remember his 95 year old great grandmother. I love Christmas - I have over 3000 ornaments I put on a 9' LIVE tree every year. Why would I not have this one? I chose this for my first great grandson and had it personalized so he will know I love him and hope it will be a keepsake for him. Because my granddaughter lost our first great grandson 2 years ago and I wanted to buy it for my Christmas Tree! Newest great-grandchild first Christmas: A tradition with all my grand & great children. I choose this because this was my fourth Great grandchild born Nov. 2016. I will need to order another for my fifth Great grandchild borb Dec. 2017 for next Christmas. It is absolutely beautiful. The inscription was perfect and the silver color was pretty. You rarely see "great grandson "
Some kind of very fragile glass product. I want to put name on ornament, but it doesn't allow me???? BEST ANSWER: there is a slot marked "select".Click on that & you will get your choice of "plain" or "personalize. I entered the name in the personalized section and it did allow me to add a name to the ornament. You may have to click the personalize it button. The recipients of these 2 ornaments we gave were thrilled with them even though the names were not were there. Guess it is a personal thing? I had no problem with his name. I also had one with my great grand daughter's name. Love them. What I did was call the company & they did it for me. I'm satisfied. It came out good. I was able to do it but I might have ordered over the phone. 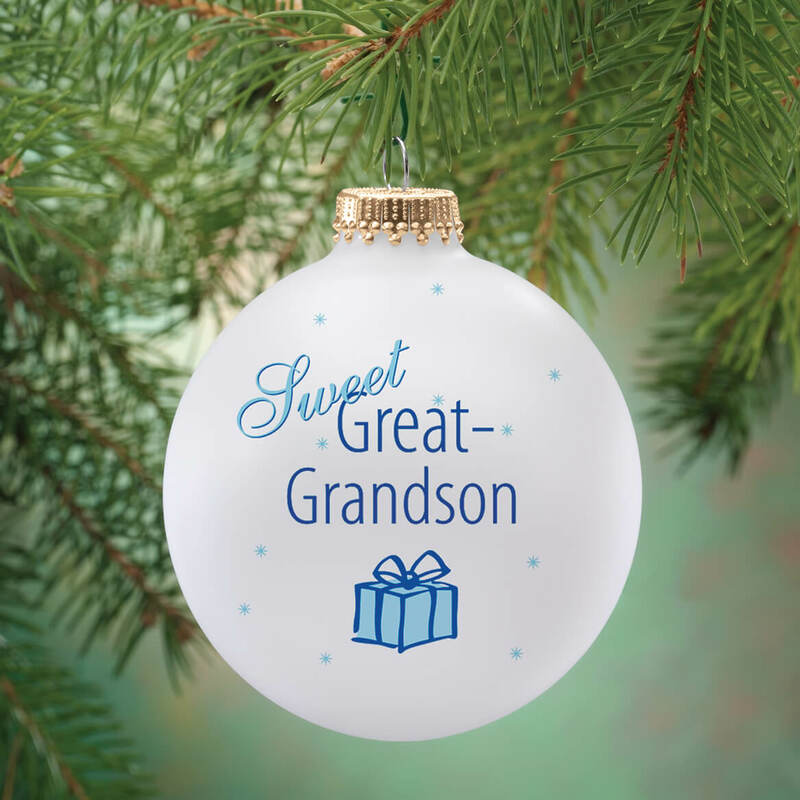 Will you ever have the great grandson Christmas ornament offered again. ?Still waiting to get one. BEST ANSWER: Thank you for your question. 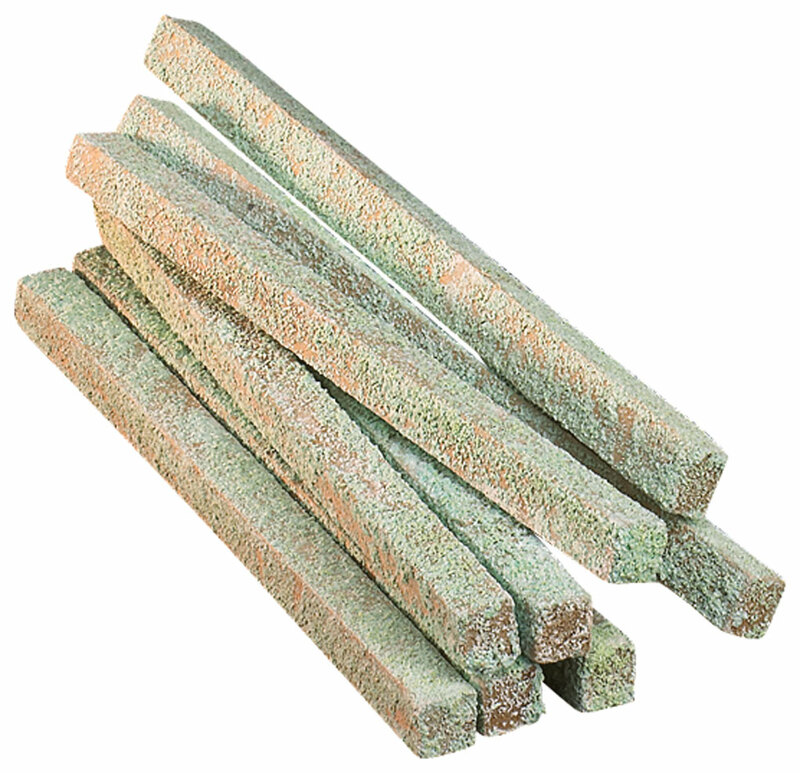 They will be back in stock during the winter of 2019. We hope this information will be of help to you.